Buying new carpet is a major homeowner expense and many homeowners end up buying the wrong grade of carpet and end up making costly mistakes. If you want to make a wise carpet selection and be sure to get your full monies worth, you need to know what carpet grade or quality level of carpet you need to buy for your home. Understanding Carpet Specifications is the ONLY sure-fire way for you to know if the carpet you are buying is able to tolerate the level of foot traffic you have in your home and about how long you can anticipate it will last and retain its like-new appearance. Buy the wrong grade of carpet and it WILL certainly wear out faster than you anticipate and you will not be happy with the outcome. 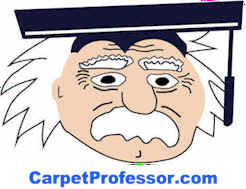 Take my free Carpet Foot-Traffic Test to see where you stand in your home. Sometimes locating all the carpet specifications you need to help you make wise and informed carpet-buying choices can be difficult, if not nearly impossible, depending on where you live and where you plan to shop for carpet. Some carpet manufacturers are reluctant to freely provide carpet specifications to their dealers and their customers. When it comes to Pile Height, Pile Density and Face-Weight...this might not be a big problem if you can find or even closely guesstimate two out of three carpet specs, then you can easily figure out the third specification...Using simple mathematics! Below I explain in detail what you need to do, and how you can quickly and easily figure out all the carpet specifications you need to acquire, even if the dealers refuse to give you hardly any information at all! If you want your carpet to last longer, I recommend a Carpet Pile Height of less the 3/4". On stairs, I recommend a Carpet Pile Height of 1/2" or less and a Carpet Padding thickness of 7/16" or less and a Pile Density Rating of at least 8-pounds. The Pile Height measurement is not usually shown on the carpet sample, however all you need is a tape measure. Don't include the carpet backing, just the soft fibers from the backing up. Convert the measurement into a decimal for calculating purposes. Example= One half inch (1/2") is equal to (.5) decimal. I generally recommend a pile height of less than 3/4" to help reduce the chance of matting and crushing of the pile. Why? A shorter Pile-Height makes for a much more durable carpet, it makes the carpet much easier to clean and makes the carpet more stain resistant and less prone to matting and crushing of the pile. For example, we all know that commercial grade carpets usually have a very short pile height and have a dense pile. They can tolerate heavy foot traffic for decades and are easily cleaned time and time again. This is the recipe for success used in offices, airports and banks all across America. Looped Berber styles are best when the loops are smaller and tightly packed together. Large loops tend to fall over and look worn out very quickly. Inexpensive looped Berber styles tend to have larger loops and are typically made from Olefin, which a durable fiber but hard to keep clean fiber (it tends to attract dirt). Better grades of looped Berber styles are typically made from Nylon and have smaller loops and are much more durable and easier to keep clean. Nylon Berber styles are often 4 times as costly as a Berber made from Olefin, however a Nylon Berber will easily last at least 4 times longer and retain its like-new appearance much longer too. A good quality Nylon looped Berber style will cost about $20 to $35 plus pad and install. Berber styles require a special padding that is more dense with a lower profile. For example a good quality Rebond padding, 1/4" to 3/8" thickness and a density of at least 8 pounds. Some prefer a rubber pad or a synthetic fiber or wool pad for basements. Pile Density is a mathematical calculation based on fiber Face-Weight and Pile Height. Think of a heavily wooded forest. The more closely packed together the trees are, the more dense the forest is. The same goes for carpet. You want a carpet with the tufts packed tightly together. This helps the carpet resist matting and crushing of the pile and increases longevity. Pile Density is the most important factor next to Fiber Type. Most carpets have a face-weight somewhere between 20 ounces and 100 ounces, but the average face-weight for a residential carpet is about 35 to 60 ounces. A higher face-weight does not automatically mean the carpet is a better grade; is a higher quality; is more durable; or is more costly. Fortunately, these three carpet specs are mathematically related which is good news for you. If you can figure out one, or two out of the three specs, then you can easily figure out all the other specifications using the formulas I reveal below! Don't worry about the number 36 or what it means, as it is a constant industry factor with all these calculations. Carpet fibers, also called yarn, is either extruded or twisted to form a single strand or "filament", These filaments are similar in size to a human hair. A bunch of filaments are grouped together and twisted together to form Tufts. While these strands are twisted, heat is applied to "set" them permanently, hence the term "heat set" or "perm". This is very similar to the way women might use a curling iron to create and set curls into their hairstyles. The tighter the tufts are twisted together the longer the carpet is able to maintain its "like-new" appearance. It is not difficult to guesstimate the number of Tuft-Twists of a carpet you are considering. Tuft-Twist is really quite simple. When you look at a carpet you can look closely at the tuft and easily count the number of twists yourself. You just need to know that it is based on the number of twists per lineal inch of tuft. Below are Tufts that are one-inch long. I have used two colors to show the number of twists. This Tuft has 7 twists and is a sign of a well-made carpet. Frieze styles have tufts similar to this and cost about $30 per square yard on average, or $3.33 per square foot. This Tuft has 4 twists and is not as good. This is a sign of a lower-grade carpet. Inexpensive Plush and Textured Plush styles often have tufts similar to this and range from $10 to $20 per square yard or $1.11 to $2.22 per square foot. More expensive styles have higher Tuft-Twist ratings. Why is Tuft Twist So Important? Carpets with a lower Tuft Twist Rating (of 3 to 5), tend to untwist or “blossom” at the tuft tips more quickly, thus creating a worn out, frizzy looking or matted down appearance. Carpets rarely wear out from the loss of fiber, they just start to mat down; gradually lose the luster and shine; and just start to look bad or ugly. Once the tufts have blossomed and become matted down, it cannot be reversed or repaired. The Tuft Twist Rating is based on the number of twists per lineal inch of the tuft. A tuft that is only a half inch long you would need to double the twist count to figure out what the twist rating is. Still, it's fairly easy to guess the number of twists with the naked eye. Compare with other known-specs carpet samples and view side by side. The Tuft Twist count usually range from 3.0 to 7.5. Lesser quality carpets will have a lower number of Tuft Twists. The higher the Tuft Twist the longer your new carpet will retain its like-new appearance. Carpet "Blossom" or blooming is a common carpet condition where the Tuft begins to un-twist and starts to look worn out, matted down and ugly! Some carpets with a lower Tuft twist rating may feature a higher pile density to try to compensate. This enhanced Pile Density will certainly help increase the carpet longevity and durability to some degree. Manufacturers of Polyester and PET Polyester carpets often use this strategy to lower costs and increase carpet durability with limited results. You will find that carpets made from PET Polyester and Polyester fibers are often less expensive than a Nylon counterpart and yet are softer and offer more pile density than Nylon. This is because Polyester is very inexpensive to manufacture. This is why they can afford to create a carpet that is more dense and less costly. P.E.T and Polyester are very soft fibers however they are not very resilient. This means they are inherently prone to matting down and crushing of the pile in medium to heavy traffic applications. If you want your carpet to last a long time and you have medium to heavy foot traffic, the you should avoid any carpet made of P.E.T. Polyester or Polyester. I would also discourage you from buying PTT, Triexta, Sorona, aka Mohawk Smartstrand if you have a Moderate to heavy traffic application. P.E.T. is an abbreviation that has nothing to do with your pets, it stands for Polyethylene Terephthalate, a plastic commonly used to manufacture plastic water or pop bottles. Nylon is the most durable and most resilient fiber used to make carpet, second to none. It is more costly to manufacture and it is not quite as soft as a P.E.T or Polyester or the Smartstrand (aka PTT or Triexta) fiber. However Nylon will typically last years longer if properly cared for and will resist matting and crushing of the pile better than any other fiber. 5. Selecting the right Carpet Fiber is the most important factor of all. New Carpet warranties are not very good. It's an eye opening experience to read a Carpet warranty. There are so many limitations and exclusions, and it's easy to see that they word it in such a way as to make it very difficult for homeowners to substantiate a valid warranty claim. You must also follow their care and maintenance instructions and requirements to the letter or risk voiding the warranty altogether. Don't buy any carpet based solely on the warranty limits alone. Let's assume you don't know what the Pile Density rating is of a carpet you are interested in buying, but you do know the Face-Weight and Pile Height. Let's assume you don't know what the Face-Weight rating is of a carpet you are interested in buying, but you do know the Pile Height and Pile Density. Let's assume you don't know what the Pile Height is of a carpet you are interested in buying, but you do know the Face-Weight and the Pile Density. Let's assume you don't know the Tuft-Twist rating of a carpet you are interested in buying. Pile Height is a Fraction turned into a decimal (like .75 for 3/4").